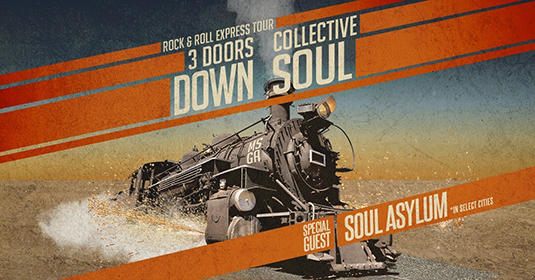 3 Doors Down and Collective Soul are heading out on the Rock & Roll Express this summer. The 36-city tour across North America kicks off July 6 at Chastain Park Amphitheatre in Atlanta. Tickets go on sale to the general public starting Friday, March 30 at 10am local time. "It's going to be an exciting summer!," said Ed Roland of Collective Soul. "Not only are we going to be out with a great band, but also some great friends. I look forward to seeing everyone come out and rock with us, 3 Doors Down, and Soul Asylum." Collective Soul rose to international fame in 1993 with the rock anthem "Shine." The multi-Platinum quintet has a catalog of #1 hits under their belts that has helped shape and define alternative rock. They've sold over 20 million records worldwide and continue to average over one million Spotify streams per month. They were inducted into the Georgia Music Hall of Fame in 2009. The band's latest live album, LIVE, was released December 8, 2017 on Suretone Records. Grammy Award®-nominated multi-Platinum Mississippi rock band 3 Doors Down has been captivating audiences around the world for nearly two decades. With 20 million albums sold globally, their success has been fueled by hits including "Kryptonite," "When I'm Gone," "Here Without You," and "It's Not My Time." Grammy Award®-winning rock band Soul Asylum will also join Collective Soul and 3 Doors Down on selected dates. "Soul Asylum, Collective Soul and 3 Doors Down, that's a big night of hits!," said Brad Arnold of 3 Doors Down. "I'm looking forward to hopping on the Rock & Roll Express this summer, gonna be fun!" The tour is produced by Live Nation.